We are so grateful we hired Nick for our wedding! We had an unbelievable amount of compliments about how beautiful and how much fun our wedding was! We attribute that to the amazing job that Nick and Lowcountry Entertainment did with the drapery and lighting, as well as the giant dance party! :) We first met with Nick prior to the wedding and he really listened to what kind of reception we wanted to have. I wanted to do something special for our father-daughter dance. Nick really helped to coordinate that... and he even e-mailed me after midnight before wedding day when I requested a last minute change! Thank you, Nick, for everything! It was unforgettable! We absolutely would recommend Lowcountry Entertainment for anyone's wedding! 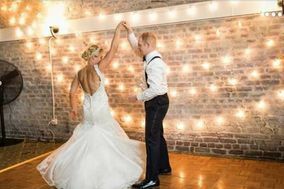 Lowcountry Entertainment was recommended to us by our wedding planner, and after working with them it's no surprise. Nick is an absolute pleasure to work with. We booked our DJ, Charlie, and rented some equipment from Nick as well. Even though our DJ wasn't scheduled to start until 7pm, Nick came to our venue several hours early to help our musicians set up. Nick is also an excellent communicator. He responds quickly and is always positive and encouraging. I highly recommend Lowcountry Entertainment. You won't be disappointed. Nick is who you want to work with! It took me awhile to narrow down to one DJ for our wedding day, and I'm so glad that I booked Nick! Before I booked him he was professional, responsive, and genuinely friendly...and he continued to be throughout the planning process all the way through our wedding day! Every time I messaged Nick he always responded quickly and gave me a thoughtful response. He did a great job creating the environment for our reception...he was a good MC, played all our songs without any glitches, and played music that represented our style for the dinner service and all the dancing that ensued after. We got tons of compliments on Nick...it felt like all the guests were truly enjoying themselves! Thank you so much, Nick! You are so talented and made our wedding so memorable! Nick made our wedding absolutely magical. The draping, the lighting, the music selection was all better than anything we could have ever imagined. Thank you so much for a night we will never forget! We knew we had chose the right person the first time we met Nick. He came highly recommended from Justin Wham and exceeded all our expectations with the music and photo booth. Our guests had a Blast as did we!!! We can’t say enough, Thank You. Nick is absolutely amazing at everything! He has been an asset to planning & his work is absolutely impeccable. You can not go wrong having him as a part of your big day. Nick was the best part of my day aside from marrying my best friend! The lighting and draping Nick did for our wedding and was beautiful! Just how I wanted it to be. Nick's added touch of elegance made our special day that much better. Nick is the man! Lowcountry Entertainment was amazing to work with. They recommended all our ceremony music (which we LOVED) and followed through on all our requests and asks for specific music. I had heard horror stories of DJs going off track and playing whatever they wanted, but we had a very specific set of music we wanted at the wedding and he followed through with everything! Also received so many compliments throughout the night on how awesome he was from our guests. Chris was a great DJ. Did music for wedding and reception. kept the music going, played the right songs when they needed to be played and keep the guest dancing and on their feet. He even danced a little. Great interaction with the guest! From the start, we connected well with Lowcountry Entertainment. We felt comfortable, at ease and confident that they would be a great fit for us. Our DJ Charlie was s big it with our family and friends. He kept the dance floor full all night and was wonderful with taking our guests requests. Everyone had a great time and they are still talking about the music. k provided DJ, lighting and draping services for our wedding at Magnolia Plantation. Not only was he quick to reply, professional, and sweet but he did an AMAZING job and all for a very affordable price. His song choices were on point and he read the crowd perfectly. He kept our party going well on into the night and he kept the energy so positive and fun. Everyone in our wedding party couldn’t stop talking about how fabulous he was! I cannot say enough good things about him or recommend him enough! As a wedding planner, I want only the best for our brides. Lowcountry Entertainment provides our clients with the best of the best! Whether were looking for an amazing DJ, draping, or lighting, we know we can always count on Nick and his team at Lowcountry Entertainment!! Nick did an amazing job with our ceremony and reception. He provided a questionnaire which was very helpful for us to think about the kind of music we wanted, and also to organize all the details we wouldn't have thought about otherwise. Guests complimented us on the reception music throughout the night, however the greatest testament to the quality of Nick's work was that the dance floor was packed the whole night! Guests were dancing even during the meal. It was literally the most fun I've ever had at a party and a total dream come true, largely in part to Nick. Thanks so much!! We couldn't have handpicked a better DJ! Nick was so easy to work with and incredibly willing to tailor his production to our preferred playlist. He made it his mission to keep our guests on the dance floor- and it was mission accomplished! Loved the playlist, the energy, and the preparation. Two thumbs up for DJ Nicky Nick! Thank you Nick for being part of our special day!! Best wedding DJ EVER!!! Your guidance and expertise throughout the process helped us tremendously. The way you incorporated our music selection was amazing and the flow of the entire event was so seamless and natural. You were such a pleasure to work with, so creative, humble and professional. Our families and friends were amazed with you and had such a blast at the wedding!! The patio lighting you did for us was fantastic, nicely done!! Thank you again for an amazing job, we HIGHLY recommend Nick (Lowcountry Entertainment) for any of your wedding DJ, Lighting, Decor needs! (he has many other services, you must check out as well)! I can't even emphasize how great Nick was for our wedding. Not only was the music fantastic but he also helped with some of the heavy lifting for some of the decor. This guy can do it all! He was great to work with and good communication throughout our wedding planning process. His prices are great too! Nick is a such a great person as well. Music was very important to us during our wedding and he nailed it. Not one guests stayed in their seats during the reception, they were all too busy dancing :). I would highly recommend him for your wedding! Edson and I had Low Country Entertainment for our wedding this past Sunday at the Carriage House in Magnolia Plantation and Gardens in Charleston, SC. They provided us with BEAUTIFUL DRAPERY AND BEAUTIFUL MOSS ON THE CHANDELIERS INSIDE THE CARRIAGE HOUSE!! Nick was so nice and accommodating! They are so reasonable in price and worth every penny! There work is the best out there! Thank you for helping make our wedding day perfect! :) I'd recommend them to anyone in the Charleston area! Nick was a recommendation from one of our other vendors after talking with at least 10 other vendors in Charleston for lighting and OMG we so lucked out! Nick was so awesome to work with! We really didn't want to have a tent, but for an outdoor wedding that is always a possibility. To help reduce my sadness over the tent, we had a back up plan for lighting for chandeliers galore at the exact same price point as our non tent plan. Wouldn't you know that we had to go with a tent, and I almost cried when I saw how beautiful our plan for a rainy day was. Lighting was breathtaking. Everything they did was phenomenal. I would recommend them to anyone for any special event you may have. As a destination Bride, I searched and searched for someone who could provide draping at my venue. Not only did Nick do an awesome job, his draping is unlike anything I have ever seen before! It was absolutely stunning! It really tied everything together and made the Carriage House look even more beautiful!